This chapter considers HIV-positive gay men’s concerns about developing the highly visible and debilitating physical symptoms of HIV and AIDS-related conditions. Visible symptoms not only exposed one to the ostracism that surrounded HIV and AIDS but for many, they signaled that one had entered the “final stage” before death. 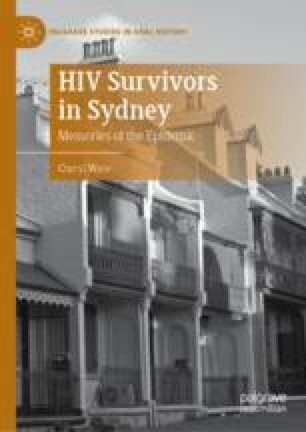 The chapter sheds light on the intense fear that some people encountered when they displayed “the look” of HIV and AIDS, the strategies narrators employed to prolong their lives, and some men’s decisions to euthanise to avoid having to endure the “final stage” of AIDS. It demonstrates the value of the oral history interviews, which offered narrators an important yet somewhat rare forum to consider and convey the emotional trauma they faced at a time when HIV was deemed a terminal condition.